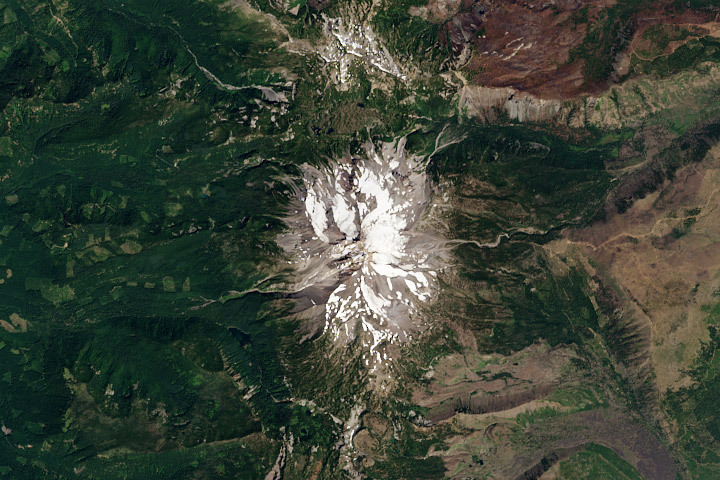 Since its launch in February 2013, Landsat 8 has collected about 400 scenes of the Earth’s surface per day. 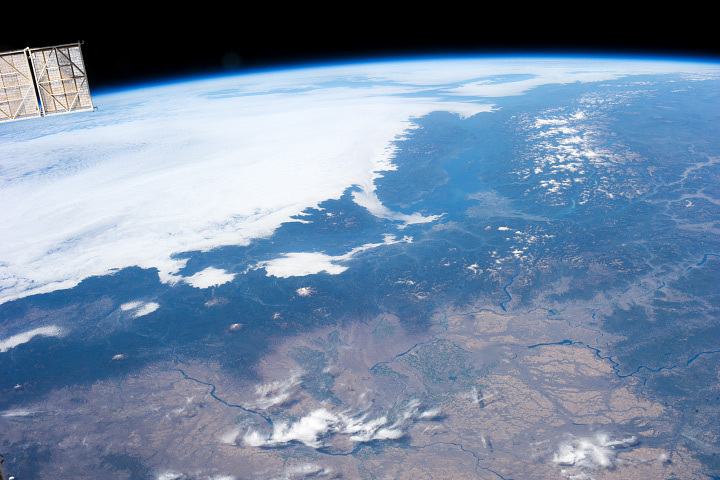 Each of these scenes covers an area of about 185 by 185 kilometers (115 by 115 miles)—34,200 square km (13,200 square miles)—for a total of 13,690,000 square km (5,290,000 square miles) per day. An area about 40% larger than the united states. Every day. Mount Jefferson, Oregon. 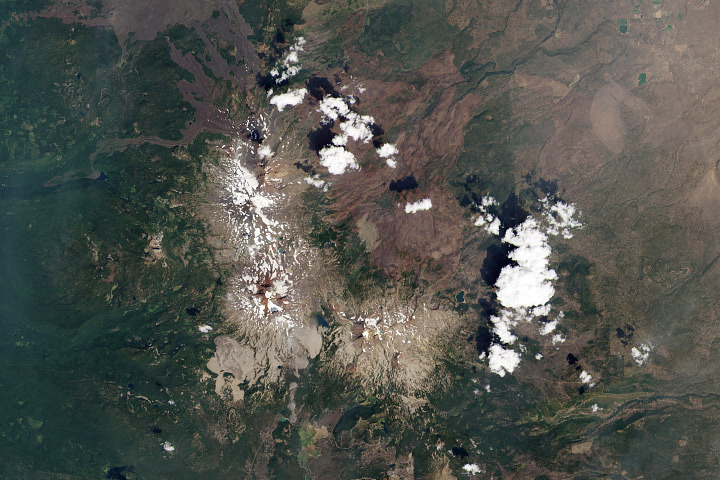 True-color Landsat 8 image collected August 13, 2013. Although it’s possible to process all that data automatically, it’s best to process each scene individually to bring out the detail in a specific region. Believe it or not, this doesn’t require any tools more specialized than Photoshop (or any other image editing program that supports 16-bit TIFF images, along with curve and level adjustments). I’ve highlighted the three bands needed for natural-color (also called true-color, or photo-like) imagery: B4 is red (0.64–0.67 µm), B3 is green (0.53–0.59 µm), B2 is blue (0.45–0.51 µm). I prefer using the red, green, and blue bands because natural-color imagery takes advantage of what we already know about the natural world: trees are green, snow and clouds are white, water is (sorta) blue, etc. False-color images, which incorporate wavelengths of light invisible to humans, can reveal fascinating information—but they’re often misleading to people without formal training in remote sensing. The USGS also distributes imagery they call “natural color,” using shortwave infrared, near infrared, and green light. Although the USGS imagery superficially resembles an RGB picture, it is (in my opinion) inappropriate to call it natural-color. In particular, vegetation appears much greener than it actually is, and water is either black or a wholly unnatural electric blue. (A)erial photographs from great heights, even in color, are often quite misleading, the Earth’s surface relief usually appearing too flat and the vegetation mosaic either full of contrasts and everchanging (sic) complexities, or else veiled in a gray-blue haze. Colors and color elements in vertical photographs taken from high altitudes vary by a greater or lesser extent from those that we perceive as natural from day to day visual experience at ground level. Because of this, satellite imagery needs to be processed with care. I try to create imagery that matches what I see in my mind’s eye, as much or more than a literal depiction of the data. Our eyes and brains are inextricably linked, after all, and what we see (or think we see) is shaped by context. You’ll end up with three grayscale images, which need to be combined to make a color image. From the Channels Palette (accessed through Photoshop’s Windows menu item) select the Merge Channels command (click on the small downward-pointing triangle in the upper-right corner of the palette). Then change the mode from Multichannel to RGB Color in the dialog box that appears. Set band B4 as red, B3 as green, and B2 as blue. The raw Landsat 8 scene is so dark because it’s data, not merely an image: the numbers represent the precise amount of light reflected from the Earth’s surface (or a cloud) in each wavelength, a quantity called reflectance. To encode this information in an image format, the reflectance is scaled, and the range of values found in the data are smaller than the full range of values in a 16-bit image. As a result the images have low contrast, and only the brightest areas are visible (much of the Earth is also quite dark relative to snow or clouds—I’ll explain why that matters later). 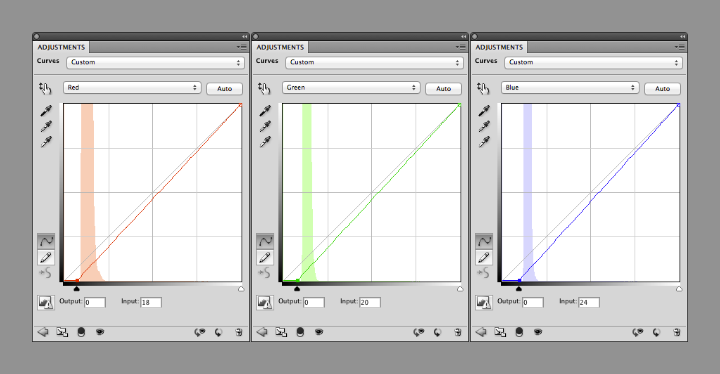 As a result, the images need to be contrast enhanced (or stretched) with Photoshop’s levels and curves functions. I use adjustment layers, a feature in Photoshop that applies enhancements to a displayed image without modifying the underlying data. This allows a flexible, iterative approach to contrast stretching. Levels and curves adjustments both allow manipulation of the brightness and contrast of an image, just in slightly different ways. I use both together for 16-bit imagery since the combination gives maximum flexibility. Levels provides the initial stretch, expanding the data to use the full range of values. Then I use curves to fine-tune the image, matching it to our nonlinear perception of light. 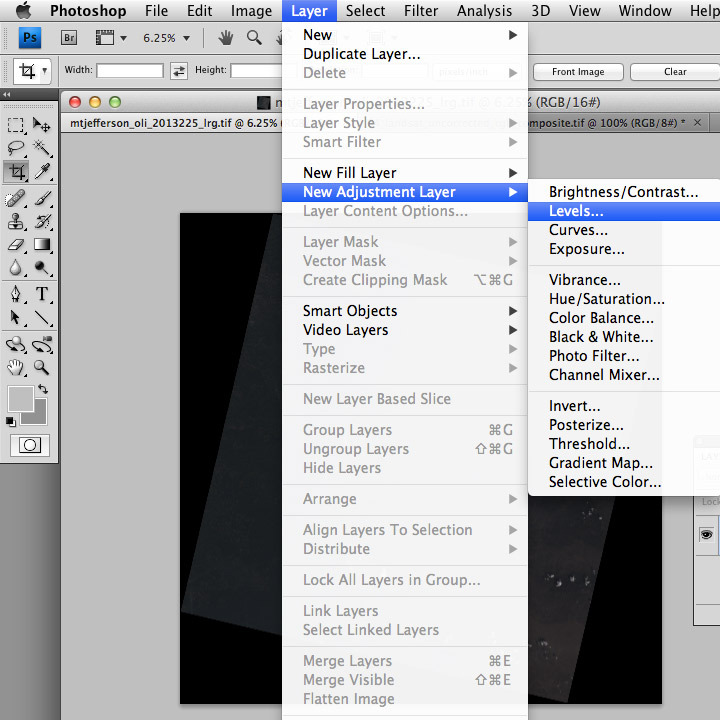 This screenshot shows Photoshop’s layers palette (on the left) and a levels adjustment layer (right). 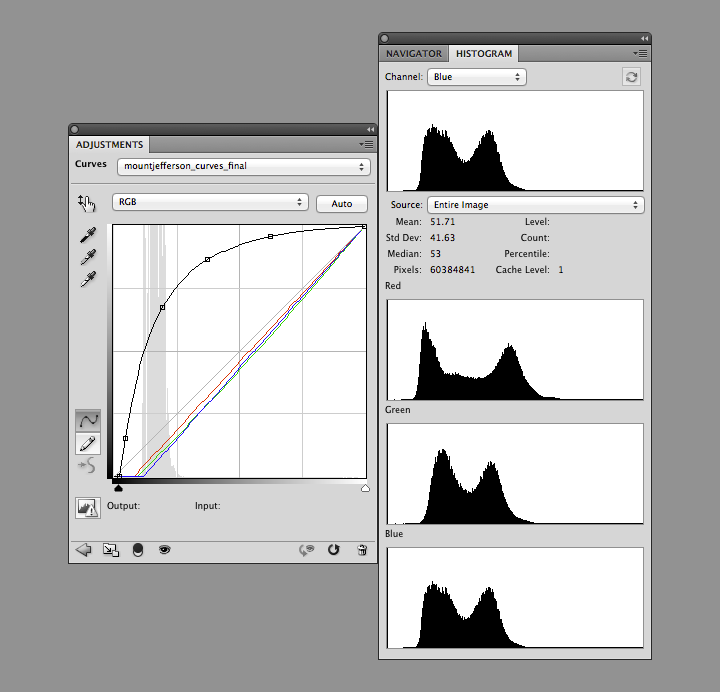 From top to bottom: the adjustment menu allows you to save and load presets; the channel menu allows you to select the individual red, green, and blue bands; the histogram shows the relative distribution of light and dark pixels (the higher the bar the more pixels share that specific brightness level); the white eyedropper sets the white point of the red, green, and blue channels to the values of a selected pixel (select a pixel by clicking on it); and the black point and white point sliders adjust the contrast of the image. Move the black point slider right to make the image darker, move the white point slider left to make the image lighter. (Important: any parts of the histogram that lie to the left of the black point slider or to the right of the white point slider will be solid black or solid white. Large areas of solid color don’t look natural, so make sure only a small number of pixels are 100% black or white). 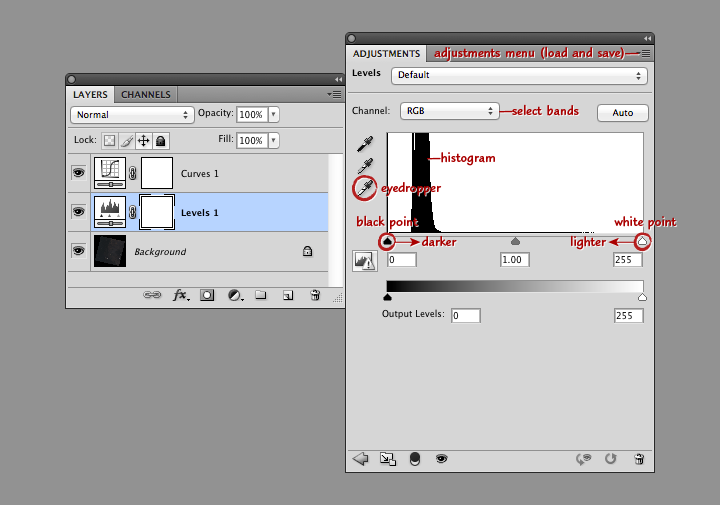 Combined black point and white point adjustments make the dark parts of an image darker, and the light parts lighter. 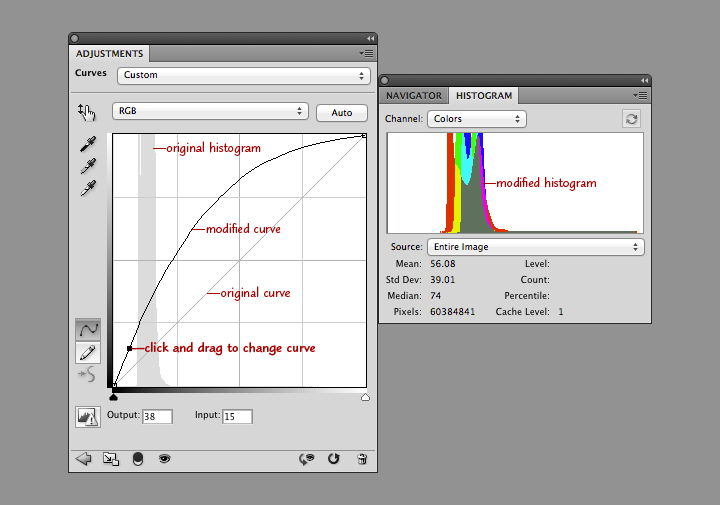 The process is called a “contrast stretch” or “histogram stretch” (since it spreads out the histogram). 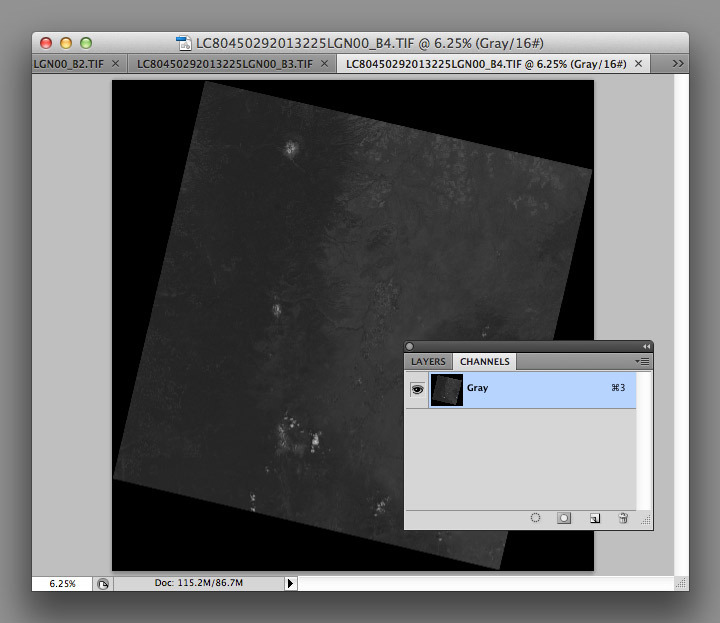 With a Landsat image, we want to do a contrast stretch to make the image brighter and reveal detail. The first step is to select the white eyedropper (the bottom of the three eyedropper icons on the left edge of the Levels Palette), and find an area of the brightest area of the image that we know is white: a puffy cloud, or even better, pristine snow. In general the brightest side of a cloud (or mountain, if you have snow) will be facing southeast in the Northern Hemisphere, east in the tropics, and northeast in the Southern Hemisphere. (This is simply because Landsat collects imagery at about 10:30 in the morning, and the Sun is still slightly to the east of the satellite.) If there are no clouds or snow, a salt pan or even a white rooftop would be a good alternative. Setting the white point does two things: the brightest handful of pixels in the image are now as light as possible, and the scene is partially white balanced. This means that the white clouds appear pure white, and not slightly tinted. 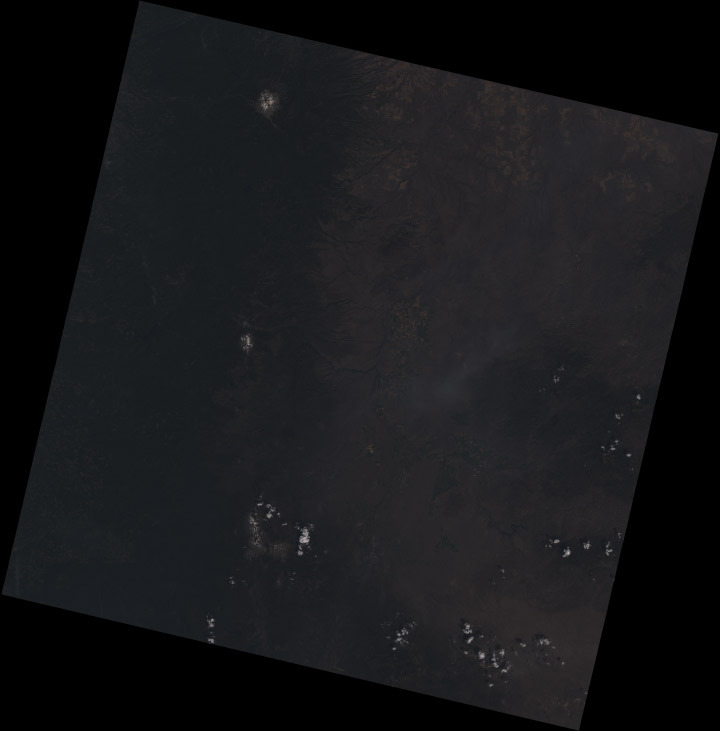 Slight differences in the characteristics of the different color bands, combined with scattering of blue light by the atmosphere, can add an overall tint to the image. Ordinarily our brain does this for us (a white piece of paper looks white whether it’s lit by the sun at noon, a fluorescent light, or a candle), but satellite imagery needs to be adjusted. As do photographs: digital cameras have white balance settings, and film type effects the white balance in an analog camera. It’s possible to automate white balancing (Photoshop has a handful of algorithms, accessed by option-clicking the auto button in the levels and curves adjustment layer windows) but I find hand-selecting an appropriate area to work best. Notice that the value of white in each channel is slightly different (213, 202, and 201), and that there’s a small number of pixels above the white point in each channel. 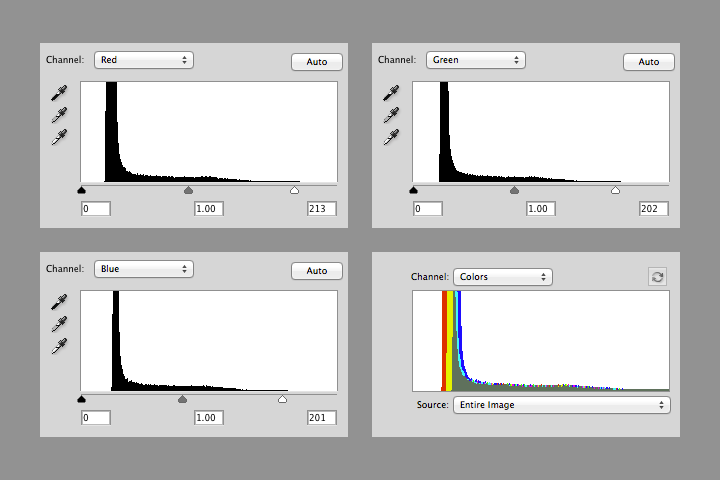 The combined RGB histogram makes it easier to see the differences between channels. The histogram also shows that most of the image is still dark: there’s a sharp peak from about 10 to 20 percent brightness, with few values in the middle tones, and even fewer bright pixels. This is typical in a heavily forested region like the Cascades. The next step is to brighten the entire image (at least brighten it enough to make further adjustments). In the curves adjustment layer, click near the center of the line that runs at a 45˚ angle from lower left to upper right. This will add an adjustment point with which to modify the curve. When it’s straight, no adjustments are made. When it’s above 45˚ the image will be brighter, and when it’s below it will be darker. Steeper parts of the line result in more contrast in those tones, while where the line is flatter it will compress the brightness range of the image. Dragging the curve to the left and down brightens the image overall, but dark areas are brightened more than lighter ones. 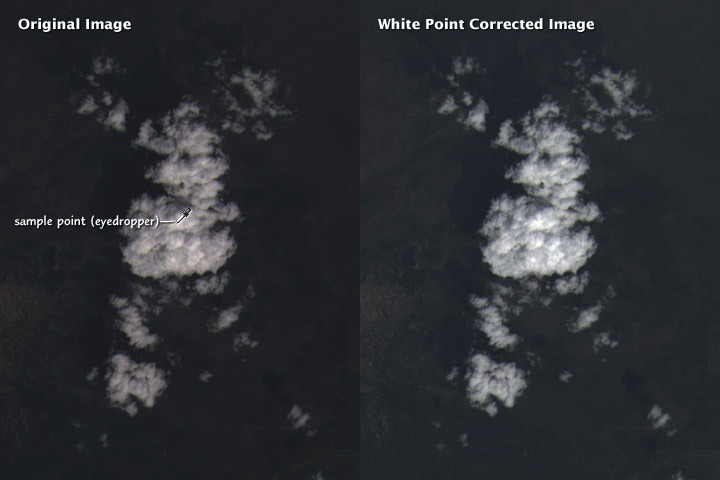 This reveals details in the land surface, and makes clouds look properly white, instead of gray. Take a look at the combined histogram (open the Histogram Palette by selecting Window > Histogram from Photoshop’s menu bar): it’s easy to see that the darkest areas of the image aren’t black, and that the minimum red values are lower than the minimum green values, which are lower than the minimum blue values. Shorter wavelengths (blue) are scattered more strongly than longer wavelengths (red), so the satellite images have an overall blue cast. This is especially apparent in shadowed regions, where the atmosphere (i.e. blue light from the sky) is lighting the surface, not the sun. We think of shadows as black, however, so I think it’s best to remove most of the influence of scattered light (a little bit of the atmospheric influence was already removed by choosing a white point) by adjusting the black points in each channel. You can change the curves separately for each channel by selecting “Red”, “Green”, or “Blue” from a drop-down menu (initially labelled “RGB”) in the Curves adjustments palette. Starting with the red channel, drag the point at the lower-left towards the right, until it’s 2 or 3 pixels away from the base of the histogram. Repeat with green and blue, but leave a bit more space (an additional 1 or 2 pixels for green, and 3 or 4 for blue) between the black point and base of the histogram. This will prevent shadows from becoming pure black, with no visible details, and leave a slight blue cast, which appears natural. The image is now reasonably well color balanced, and the clouds look good, but the surface is (again) dark. At this point it’s a matter of iteration. Tweak the RGB curve, maybe with an additional point or three, then adjust the black points as necessary. Look at the image, repeat. I find it helpful to walk away every once in a while to let my eyes relax, and reset my innate color balance: if you stare at one image for too long it will begin to look “right”, even with a pronounced color cast. I sometimes find it helpful to find photographs of a location to double-check my corrections, either with a generic image search or through a photography archive like flickr. It helps give me a sense of what the ground should look like, especially for places I’ve never been. Keep in mind, however, that things look different for above. In an arid, scrub-covered landscape, for example, a ground-level photograph will show what appears to be nearly continuous vegetation cover. From above, the spaces between individual bushes and trees are much more apparent. The Three Sisters Volcanoes from the ground. Scattering in the atmosphere between the photographer and the distant mountains causes them to appear lighter, bluer, and fuzzier than the brush in the foreground. In views from space, the entire image will be affected in a similar way. ©2006 Robert Tuck. Notice how each of the bands have two distinct peaks, and most of the histogram (select All Channels View to see separate red, green, and blue channels) is packed into the lower half of the range. 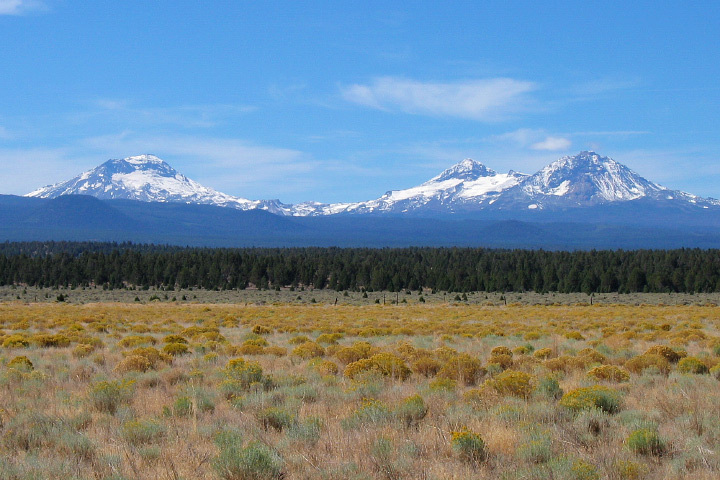 The bimodal distribution is a result of the eastern Oregon landscape being split into two distinct types: the dark green forests of the Cascades, and the lighter, high-altitude desert in the mountain’s rain shadow. The skew towards dark values is a compromise. I sacrificed some detail in the forest and left the desert a little dark, to bring out features in the clouds. If I was focusing exclusively on a cloud-free region, the peaks in the histogram would be more widely distributed. Fortunately Landsat 8’s 12-bit data provides a lot of flexibility—adjustments can be quite aggressive before there’s noticeable banding in the image. The full image has a challenging range of features: smoke, haze, water, irrigated fields (both crop-covered and fallow), clearcuts, snow, and barren lava flows, in addition to forest, desert, and clouds. The color adjustments are a compromise, my attempt to make the image as a whole look appealing. I’d use a different set of corrections if I was focused on this area (and probably select a scene without smoke, which is visible in the center of this crop). These techniques can also be applied to data from other satellites: older Landsats, high-resolution commercial satellites, Terra and Aqua, even aerial photography and false-color imagery. Each sensor is slightly (or more than slightly) different, so you’ll probably use different techniques for each one. To practice, download a true color TIFF of this Landsat scene [(450 MB) right-click to download, you do not want to open it in your browser] with my levels and curves, or pick your own scene from the USGS Earth Explorer (use my guide if you need help ordering the data). 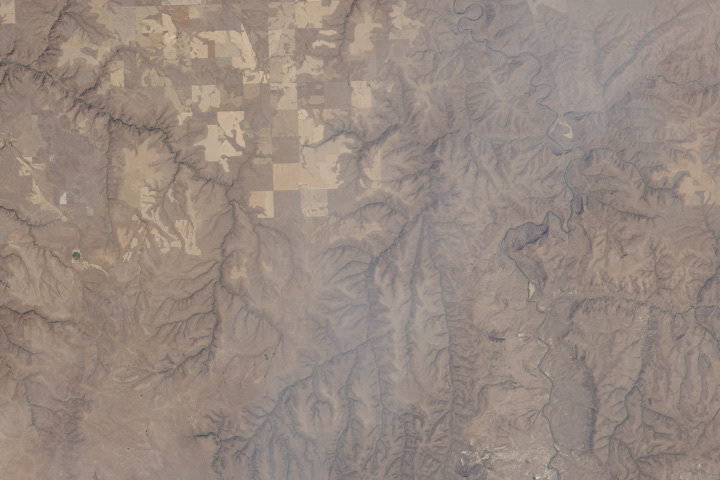 If you’re interested in different perspectives on creating Landsat images, Tom Patterson, a cartographer with the National Park Service, has an excellent tutorial. 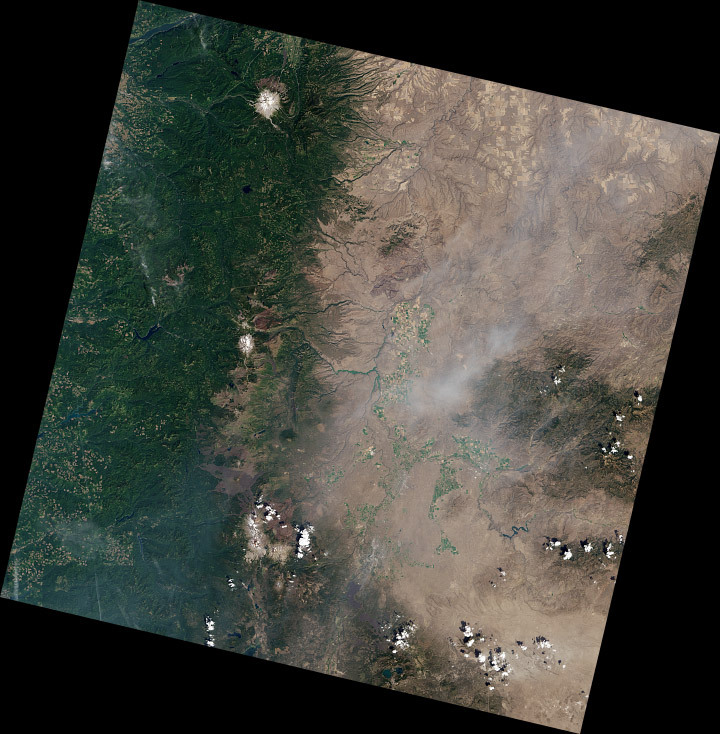 Charlie Loyd, of MapBox, has a pair of posts detailing Landsat 8’s bands, and a method for using open-source tools to make Landsat images. Complete fidelity to natural color can not be achieved in a map. Indeed, how can it be when there is no real consistency in the natural landscape, which offers endless variations of color? For example, one could consider the colors seen while looking straight down from an aircraft flying at great altitude as the model for a naturalistic map image. But aerial photographs from great heights, even in color, are often quite misleading, the Earth’s surface relief usually appearing too flat and the vegetation mosaic either full of contrasts and everchanging complexities, or else veiled in a gray-blue haze. Colors and color elements in vertical photographs taken from high altitudes vary by a greater or lesser extent from those that we perceive as natural from day to day visual experience at ground level. The faces of nature are extremely variable, whether viewed from an aircraft or from the ground. They change with the seasons and the time of day, with the weather, the direction of views, and with the distance from which they are observed, etc. If the completely “lifelike” map were produced it would contain a class of ephemeral—even momentary—phenomena; it would have to account for seasonal variation, the time of day and those things which are influenced by changing weather conditions. Maps of this type have been produced on occasion and include excursion maps for tourists, which seek to reproduce the impression of a winter landscape by white and blue terrain and shading tones. Such seasonal maps catch a limited period of time in their colors. —Eduard Imhof, Cartographic Relief Presentation, 1965 (English translation 1982). This entry was posted on Tuesday, October 22nd, 2013 at 5:51 pm and is filed under Uncategorized. You can follow any responses to this entry through the RSS 2.0 feed. Both comments and pings are currently closed. That is great and very detailed. Thanks. This is an excellent tutorial. Thanks for taking the time to write it up! The reason that the USGS does not use the native LZW compression option in libtiff, particularly as it pertains to Landsat 8 data, is that the algorithm does not perform well on 16-bit data. LZW was designed to operate on 8-bit input, and 16-bit data gives it a lot of problems. In fact, if you Google “16-bit TIFF LZW”, you’ll find all sorts of questions and tales of woe about how attempts to apply this compression actually made the input file *larger*, which sort of defeats the purpose of the exercise. Now, having said that, one of the defining characteristics of Landsat Level 1 products is the large amount of surrounding blackfill that is created by the north-up rotation process. All of that zero-value data will of course compress to almost nothing (regardless of the compression algorithm or the bit size of the input data.) And so even though the LZW algorithm doesn’t work well on the imagery itself, you *can* use it to reduce the size of each band when the net effect of the blackfill is taken into account. The problem is that it doesn’t compress nearly as well as gzip/zlib does. I took a recent Landsat 8 scene and compressed a 498 MB panchromatic band down to 368 MB using the LZW compression option. However, this same band compresses to 280 MB using gzip. Given the sheer size of Landsat 8 scenes, the goal is obviously to reduce the size of the download package to whatever degree possible — they’re big enough as they are! This should be fairly easy to script up in Perl/Python/etc. Again, this compression is not *ideal* for Landsat 8-like data, but given the “blackfill effect” it does reduce the on-disk size, and as you note, it should work transparently for most applications that can read TIFFs or GeoTIFFs. Great tutorial! I really like the idea of making Landsat images available also to the wider public and this really helps that purpose. The only thing I would add are notes about equivalent tools in free software, like GIMP instead of Photoshop. Thanks! Thanks for the recommendation. I don’t use GIMP, so I can’t write about it with any authority. I followed the instructions. But in my results, the image lost the georreferencing. Unless you have something like Geographic Imager (a commercial plugin) installed, Photoshop will lose georeferencing.